Mary Miller makes dance with something to say. For many people, an encounter with an angry motorist is an everyday annoyance. For Mary Miller, it was an inspiration: Facing road rage led the dancer and choreographer to create the Peace Project, a five-year exploration of peace through movement. The latest installment is Together, Mary Miller Dance Company's collaboration with Philadelphia-based SHARP Dance Company, with three shows Nov. 16-17, at Open Stage Theater. Unlike a choreographer whose creative process begins in the studio, says Miller, "I start from the point of human experience and expand from there." Audiences get to relate, and even sometimes take part in, the performance. "There is a commonality among all of us; for example, we all want a good life," says Miller, her company's artistic director. "Dance is my voice, my language. So, I use dance to remind people of the connections we share." The goal of connecting people extends to Miller Dance Company's collaboration with SHARP, an edgy modern and hip-hop dance group. The collaboration did not emerge from the blue: SHARP artistic director Diane Sharp-Nachsin was a dancer for Mary Miller from 1992-1996. Sharp-Nachsin, who formed her own company in 2005, echoes Miller's mission statement. "My work comes from having something to say," says Sharp-Nachsin. "It's not just arbitrary movement in the middle of the floor." Both companies prize unpredictability. "A big part of creativity is humor," says Miller. "I am moved by issues that present themselves to be funny. And I'm not preachy. I approach it as, 'I'm thinking about this, what do you think?'" The Nov. 16 and 17 performances here also feature local guest artists including musician Ellen Gozion, spoken-word artist Vanessa German, and musician and performance artist Stephen Pellegrino. Looking ahead, Miller and Sharp-Nachsin hope that this year's collaboration will be one of many. They intend to broaden their audience by reprising Together in Philadelphia. Meantime, audiences for Together here should expect a roller-coaster ride of emotions and life experiences. Miller's works include a dance about the experience of dreaming. Sharp-Nachsin's sensual dance "Linear" tells the story of a woman who's living life on the straight and narrow until a love interest has her stepping out of her comfort zone. 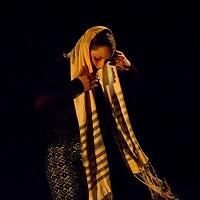 Perhaps audiences who connect with the work on stage will have a better chance of connecting with one another, as well.